Cafe Scientifique is a gathering of science-enthusiasts who meet in a particular time to discuss, share or debate about science-related concerns usually done in cafes, bars, restaurants and even theaters. There are 42 cities around the it was formed in 1998 regularly participate in this event world since composed mostly of scientists to empower non-scientists to understand the technicalities in a more approachable way. 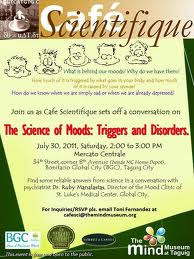 Cafe Scientifique Manila was born only in November 2006 led by only known Pinay science writer Maria Isabel Garcia, also one of the curators of the first ever world-class science museum called "The Mind Museum".